Fate, it seems, can reach its mystical powers into the culinary world and alter the course of events; in this case, for the better. Yesterday the MHK had our stomachs set on having Father’s Day dinner at Dinosaur BBQ, but when we were told it was already a 30-40 minute wait at 4:30 in the afternoon, we scrambled to come up with an alternative plan. I had heard about a place called Yanni’s Too down in Coeyman’s Landing, and when we were told it was only a 25 minute wait, we put our name on the list and headed south. It turns out this was a marvelous decision. The fact that the weather was picture perfect didn’t hurt as we pulled into the marina in Coeyman’s Landing, a town where the people are probably outnumbered by the boats in the water and lined up along the marina. 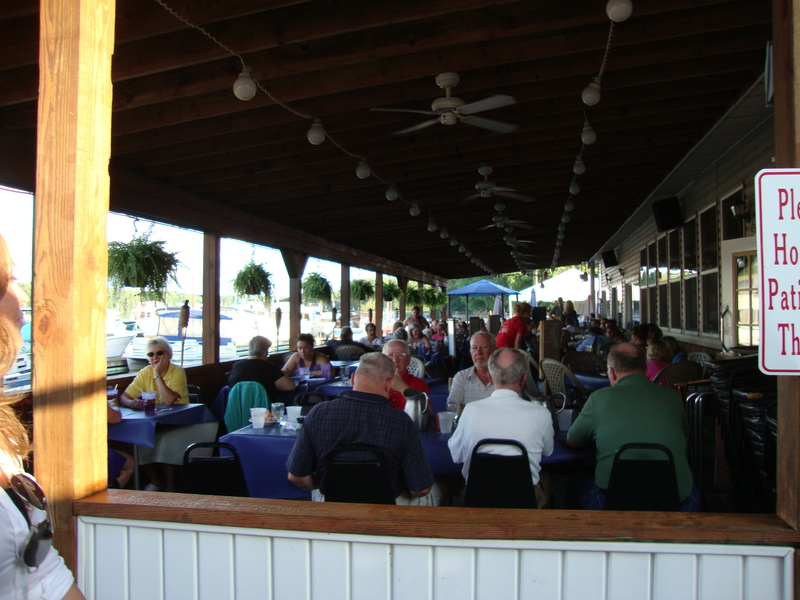 Yanni’s Too is situated right on the Hudson, with a spacious indoor area along with a nice sized patio looking right at the marina. The atmosphere is very laid back, and the busy crowd was partaking of the bar and enjoying the view. Our group was initially seated indoors, but after some pleading and cajoling, they were able to move us to a table on the patio in the shade. It was a beautiful setting for the great meal to come. Chef Marc Yanni opened his original Yanni’s in Ravena in 1999. He closed that location and opened the much larger Yanni’s Too, and it has become a local favorite. His wife and daughters are employees as well, and you can feel the family-run vibe. Chef Yanni has also been dubbed the “Calamari King,” a title that the MHK met with some skepticism, and so of course the first thing we ordered was the Calamari Four Way. 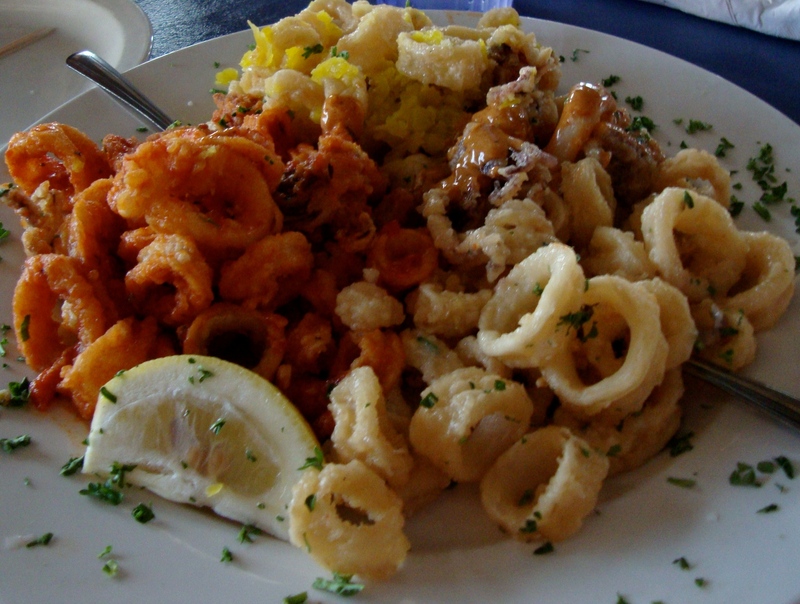 We were served a giant plate with the four different fried calamari preparations that Yanni’s Too offers: lemon-garlic-wine sauce, marinara sauce, calamari with banana peppers, and a chipotle sauce. The breading was light and flaky, and all four variations were fantastic. The basic garlic-wine sauce was very tasty, the marinara was brimming with tomato and Italian seasonings, the banana peppers were fresh and tangy, and the chipotle sauce was smoky and actually a little spicy. It was a huge platter that we could have easily cleaned if we did not have more food coming. The MHK has no reason to argue that Chef Yanni is indeed calamari royalty. For a seafood joint in a tiny town, Yanni’s has a nice wine list along with a lot of signature cocktails. Their menu is quite extensive, featuring non-calamari appetizers like chicken wings, stuffed clams, crab cakes, and four different preparations of oysters. They also have soups, including their Troy Chowder Fest award winning New England clam chowder (chow-dah! ); the salad offerings include a pecan-crusted chicken salad, a seafood Cobb salad, and a Thai shrimp noodle salad. There are burgers and sandwiches, including their house-roasted pastrami, plus fried seafood of nearly every kind. Entrees include steaks, pasta, and of course lots of seafood, such as the seafood Newburgh manicotti, lobster mac-n-cheese, and grilled scallops. There is a kid’s menu, and a specials menu with at least a dozen items on it. For our entrees, we went with the sesame-crusted tuna, the grilled salmon, the surf n’ turf special, and the lobster roll special. All but the lobster roll came with saffron rice, a piece of corn on the cob, pickled purple cabbage, and a fresh roll. The tuna was very good – it was seared nicely on the outside, and the sesame seeds gave a nice texture contrast to the smooth tuna. It was served on an amazing seaweed salad with a wasabi aoli; I thought this component was better than the tuna itself. The salmon was perfectly cooked and flaked apart beautifully. The filet was also cooked with great care, and the accompanying lobster tail was succulent and tender. The rice was pretty good, the corn was very juicy, and the pickled cabbage was tangy and an unexpectedly great compliment to the rest of the items. The roll was interesting – we detected a distinct BBQ aroma to it and we asked our server about it. She explained that the rolls are baked in the same oven where they finish off the dishes from the smoker, so that smoky flavor gets infused into the bread; take note, every other BBQ place. The lobster roll, simply put, has to be the best you can get outside of Boston (or probably Maine). The fresh baked ciabatta roll was light and chewy, and was stuffed with a very generous portion of lobster meat – large chunks of it at that – tossed with small bits of celery and herbs and very lightly dressed with mayo. The lobster was the clear star of the dish, not weighed down by disproportionate amounts of mayo or bread (which is what you’ll find at other places around here). It was served with coleslaw (which did have way too much mayo) and some very good sweet potato fries. We had no room for dessert, but the white board advertised an array of mouthwatering selections like Snickers pie, cheesecake, and many other treats. Price-wise, Yanni’s is a good value. Appetizers are all under $10 (except the one we got which was $12.99), salads range from $11-$14, burgers and sandwiches are all around $10 or $11, and the entrees will set you back $14-$25. But for the amount of food and the quality, it’s worth it. Sipping wine while watching the boats motor up and down the river, enjoying fresh, delicious food in a relaxed, friendly atmosphere – these are what Yanni’s Too has to offer, and with just a 20-minute drive from Albany, there’s no reason you shouldn’t go check it out. The Mouse House Kitchen gives Yanni’s Too 4.5 out of 5 stars!